I INVITE ALL REGISTERED USERS TO ASK QUESTIONS AND PROVIDE ANSWERS. IF YOUR NOT REGISTERED THINK ABOUT JOINING US, READ OUR CHARTER AND PLAN ON ABIDING BY THERE PRINCIPLE. WE DON'T ASK FOR MUCH FROM OUR CLUB MEMBERS, CONDUCT YOURSELF WITH FAIR PLAY IN MIND AND ALL ELSE WILL FALL IN PLACE. I will be looking in the discussion section for a dialogue on this subject to develop an instruction section. I am trying to keep the instructions separate from the discussion so we can have a tight clean reference to go to and review. These threads can find themselves following many different paths, and the intention of the instructions can become lost. I will review all the posts in discussions and update and expand the instruction topic as needed. Let’s go guys spread the wealth tell us what you know. Okay, where should we start? I propose to start with confusion and controversy! I don't think I have met another skipper out there that does what I do to work out mid because I never match the hosts mid predictions (although its close) and when I ask other skippers all answers are different lol. Here's 'my way' (Frank Sinatra). For me, Quite simply mid is the twd bearing that means if two boats started close hauled 30 twa/ 160 twa spinnaker, same speed and the same distance from any point directly down/upwind on port and starboard tack, they would meet exactly bow to bow. So no gain on either tack. So if mid worked out to be 0 (the most common and easiest mid to work out) and the twd shifted to 350. A boat starting on port tack at the pin end would be clear ahead of a starboard boat at the committee boat end so long as they both start at same speed and cross the line at the same time. If a host/server has a different mid this could give u the prediction of a wind bend later on after the start. But you will know which tack gains with which angle for all of the race (that stays the same). Any Qs Comments please post, have a go see how u get on. I would be most glad to here I am not the only one who does this. that works with a square line, chief. I tend to sail up the first leg and clock any patterns (furthest left and right I see) maybe time them too. Point your boat at the first mark, prestart and use the heading you get to give a rough idea of a mid (if the mark looks dead up wind that is) and the rest is down to tide, traffic and circumstance. Not necessarily, you can have a port end bias because that end is closer to the mark but in a right hand phase you would start at port end on starboard and wait for the shift. Then you can have a busy track when its best to start away from others in clear air while the rest get in a mess, what I'm saying is nothing is set in stone dont rely on one method. I agree sly everything else is not set in stone other than position of marks and your suggestions are all good. But all I want people to understand is, how to work out the basic favourable tack and that is simple. Get mid (90 degrees) from the start line square or not, All else stems from that for me. Mid is one of the fundamental basics. Most people have no idea what it is or how to work it out, and everyone else has a different opinion. But for me start with this basic principal that is set in stone and you should notice a difference. A bad idea shared is better than no idea kept in secret. If you guys do contact each other by phone please don't abandone this thread . I agree with John, you guys would be surprised how much someone can learn by just simply reading through a post on a particular topic. Ill be giving this a go at tomorrows race, the only thing to work out then is TWD, and how that works to give an advantage. Since the True Wind Direction has a bearing on this conversation it may be pertinent to give a brief description of this and perhaps how that works in conjunction with the Mid to give an advantage. My understanding of the mid is closer to Sly's understanding. For me the mid is the angle in between the middle of the start line and the first buoy. If the TWD is higher than the mid it's better to start at the right side of the start line and sail starboard side and of course if the TWD is lower than the mid it's better to start at the left side of the start line and sail port side. This is of course theoritical and doesn't consider the current, the obstacles and the fact that sailing startboard side gives you the priority. For me what Jammy is saying is how to determine the favourable side of the start line if it's not perpendicular to the line between the middle of the start line and the first buoy (what I call the mid). If the angle determined by Jammy's method is higher than the mid (my mid), it's better to start on the left side of the start line and vice versa. As I speak french I find sometimes some interesting points of view on these racing tips which are quite useful. I need to draw/ post some pictures to make my case clearer, hard to put into words. All methods discussed so far have merit, and give a general feeling of what mid is and agree on how u should sail using mid. 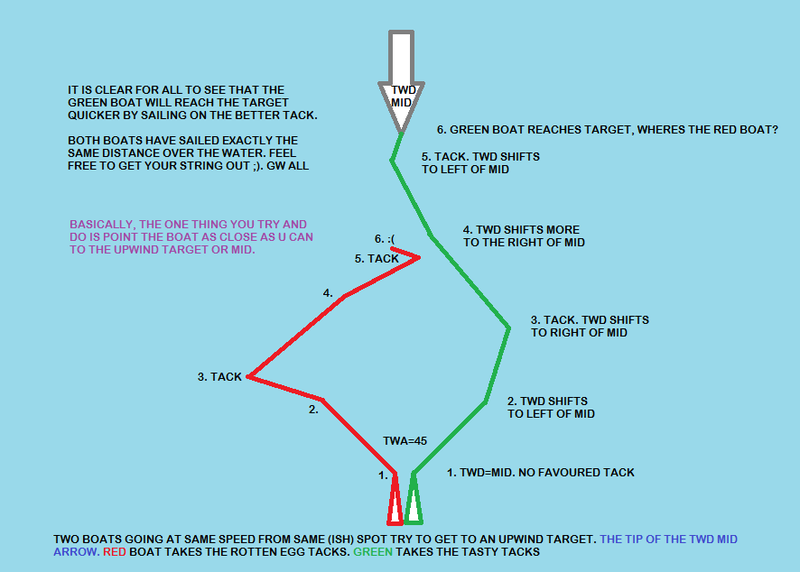 Basically, unless u are sailing with a twd=mid there will always be a preferable tack and end of start line, depending on what side of mid the twd is. Ok guys. 1 What is Mid. 2 How to find it. 3 Why is it improtant. 1. Mid is the wind direction half way between the left most and the right most wind direction changes. This has nothing to do with the start line. That would be finding the favored end and is a different discussion all together. 2. The easyest way to find Mid is to pay attention to the intro or ask the hoast. Remember we are talking about a simulator here. In the real world get to the start area extra early. I could go on and on about that. we only get five minutes or less in the game. You have to watch the shifts TWD. You may not figure out mid untill five minutes into the first leg. I use a small card board compass with a rotating bezel. You can make one or perhaps buy one. Any way I eather set the mid I get in the intro or keep recording the TWA on the compass. I mark the farthest left and the farthest right chop that number in half and you get the mid. 3.It is important because to win you need to be on the favored tack most of the time if not all the time. If the TWA is the farthest to the right sail on starboard tack. You will be sailing a shorter distance to the mark. As the wind starts moving to the left keep an eye on it if you tack when it starts to move to the left you will get lifted on port tack. the idea is to sail on the lifted tack as much as possable. I can expand on these points if I wasnt clear enough. Couldnt put it better myself, chief. Expand away so everone can have there light bulb go on. I found some free ware on the net that I can use to create some diagrams that will illustrate that shortes course you discribed. We need to get some clear worded instructions for the math. I think its starting to make sense to me, although I admit to being a little slow in this area, strange how someone can have virtually no knowlege of Mid and how to utilize it, and still perform at the top to middle range of sailors out there. Good explaination anyhow...and this thread is developing nicely, well done Pat, and well done all. Good one fellas.